Every winter, a spectacle unfolds along the California coast that's unlike any other. At that time, thousands of northern elephant seals gather on the beaches, returning from a long stay at sea. Within just a few short weeks, it's a flurry of activity as males fight to become the dominant bull, females come ashore, babies are born and weaned. After that, they all return to the ocean again where they will stay for most of the next nine months. The breeding colony at Año Nuevo State Park north of Santa Cruz is just a short hike away from a parking area. Taking a walk from there, visitors get an extraordinary opportunity to see them up close. Volunteer naturalists lead tours, explain the goings-on, and keep the elephant seals and humans safe from each other. If you're lucky, you might see a pup being born or watch a battle between two males. Most of the fights are mere skirmishes, but exciting nevertheless. You may also hear the 2.5-ton bulls make their odd bellowing calls that some people say sounds like a motorcycle in a drain pipe. You can hear a recording of it at the Marine Mammal Center website. The only way to see the seals at Año Nuevo during breeding season is on guided tours, which happen daily from December through March and last about 2.5 hours. Reservations are a must, and individuals can start making them in mid to late October. You can get more information on this year's dates at the Año Nuevo State Park Website. January and February are the best months to see the action at Año Nuevo, but that's also when the weather tends to be the worst. If you go earlier than that, you'll see the males coming ashore but will be there too soon see the adorable seal pups. If go after February, you'll find only the young sea lions but you won't see any adults. No food or beverages (except bottled water) are allowed on the tour, and no refreshments are available at the park. Even if it's raining, umbrellas are not allowed on the walk because they frighten the animals. The walk is about 3 miles long and moderately strenuous. The path to the viewing area is not suitable for people with mobility impairments. However, the park can accommodate people with mobility issues on a boardwalk path (with reservations). Año Nuevo is just off U.S. Highway 1, 20 miles north of Santa Cruz and 27 miles south of Half Moon Bay. The park's address is 1 New Years Creek Rd, Pescadero, CA. If you can't get to Año Nuevo or your schedule is too unpredictable to allow you to make a reservation, you can also see the elephant seals at Piedras Blancas near Hearst Castle. At that location, you can walk near the breeding colony on a boardwalk path anytime. 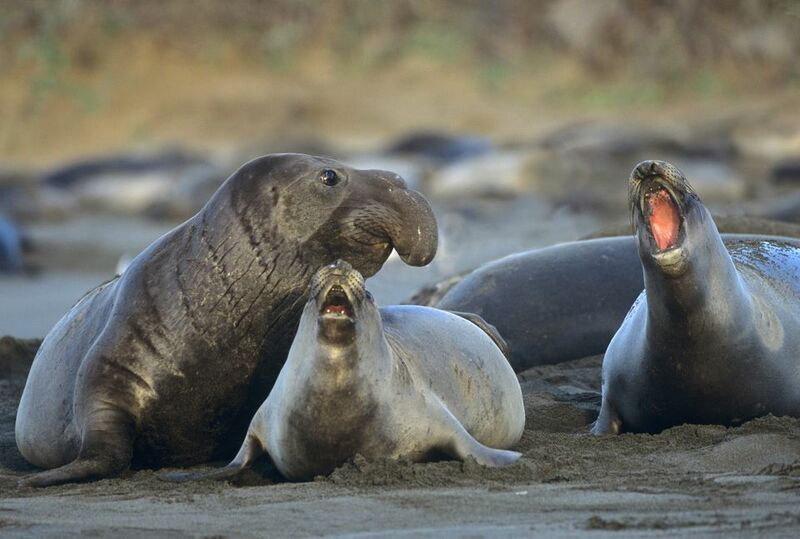 You can see elephant seals of all ages in this collection of photos from Piedras Blancas. Elephant seals spend most of their life at sea. Starting in late December, they begin to come ashore one by one, starting with the males. Fourteen to sixteen feet long and weighing up to 2.5 tons, the big guys engage in small skirmishes that can escalate into violent battles to establish dominance and the right to settle in the center of the harem and mate with all its females. Females come on shore next. They bear a single, 75-pound pup, then they gather in large harems. They nurse their young for about a month, mate, and then abandon the youngsters (who now weigh up to 350 pounds) to return to the sea. By March, most of the adults are gone. The young ones, called "weaners," amazingly learn how to swim, find food, and survive on their own. Unlike other animals, elephant seals shed all their hair abruptly, returning to the shore again during spring and summer to molt. The rest of the year they are at sea, where they spend up to 90% of their time under the water, diving for 20 minutes at a time to a depth of 2,000 feet searching for food. To learn more about the fascinating elephant seals and to hear a recording of their bellowing calls, visit the Friends of the Elephant Seal website.